They said it could be harmed and humiliated, but in the end it was Merion Golf Club that did the bullying in the first round at the US Open. At 6,996 yards the shortest US Open test in nine years and softened by three days of heavy rain over the past week, all the talk before the tournament began was whether major championship golf history would be made with a first-ever 62. To date 25 players have shot 63s in one of golf’s four crown jewel tournaments — the Masters, US and British Opens and PGA Championship — but no one has gone lower. As it turned out, not only did Merion in suburban Philadelphia avoid the fate of being the first major course to give up a 62, it also left some of the world’s best golfers battered and bruised. Of the 156 first-round starters, only five managed to better the par of 70, Phil Mickelson leading the way with a three under 67 set on Thursday before darkness fell and left half of the field with their first rounds incomplete. The reality was that the course, though short on size, has large and sharp teeth in the form of punitive rough, deep bunkers and some wickedly-deceptive risk/reward holes. England’s Ian Poulter, who setted for a first round of 71, was scathing of TV commentators who he said had mocked Merion in the buildup to the tournament. “They were joking around, laughing at 63s and 62s and just look at the board,” he said. Thursday’s muggy, stormy weather, which brought two play suspensions that totalled about four hours and 15 minutes, was replaced by equally damp but colder conditions on Friday as the wind direction switched from south to north. The end result though was the same as players struggled to make pars. Englishman Luke Donald, who completed an excellent round of 68 to stand in joint second place, agreed that Merion, hosting a US Open for the first time in 32 years, had taken many players by surprise. “I think everyone thought that as soon as the course got wet it was going to play easy. The scores certainly aren’t showing that,” he said. World number one Tiger Woods, who injured his left wrist on Thursday when trying to extract his ball out of Merion’s deep rough, said that the changing conditions had quickened up the green speeds. 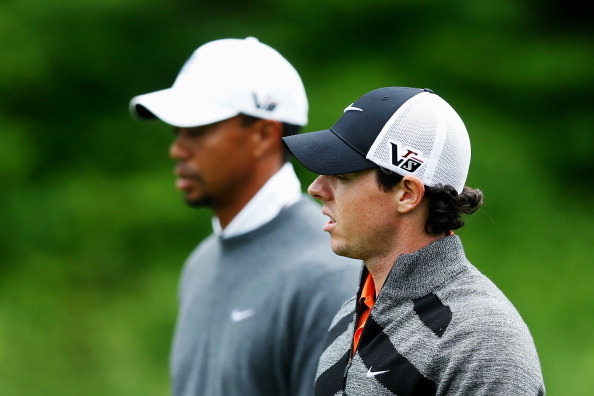 “It’s unbelievable how much faster they were this morning,” said Woods, who settled for an edgy 73. With sunnier and warmer weather forecast for the weekend, Merion could become an even tougher test and what seems highly unlikely is that there will be any repeat of two years, ago when Rory McIlroy won at Congressional Club in Washington with a record 16-under par total.